Remove shells from shrimp, leaving tails intact. Set shells aside for the stock. Using a small, pointed knife or shrimp deveiner, make a shallow cut lengthwise down the back of each shrimp, then wash out the vein. In 4-quart Dutch oven, heat shrimp shells, 4 cups water and 2 teaspoons salt to boiling over high heat. Add wine, 2 tablespoons lime juice, the peppercorns and handful of cilantro. Reduce heat to medium. Cover and cook 30 minutes. Strain stock through strainer into large bowl and discard shells, peppercorns and cilantro. Return stock to same pan and heat to boiling over high heat. Add shrimp; remove pan from heat. Cover and let stand 8 to 10 minutes until shrimp are pink and firm. Meanwhile, fill large bowl half full with ice and water. Strain stock through strainer and plunge shrimp into ice bath. (Strain stock over large bowl if you want to keep for another purpose.) 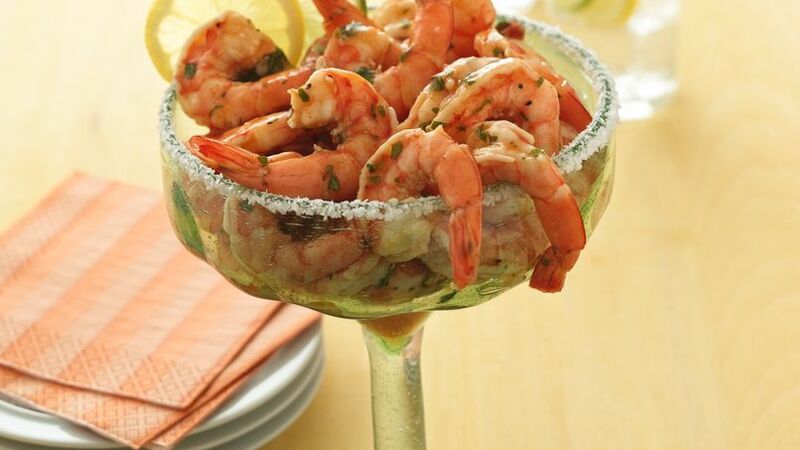 Shrimp can be refrigerated in ice water for several hours. In medium bowl, mix all sauce ingredients. (Don’t use aluminum bowl because the acid in the sauce may react.) Stir in cooked shrimp to coat. Cover and refrigerate at least 30 minutes but no longer than 3 hours. (After 3 hours the acid in the sauce causes the shrimp to become chewy.) Serve cold. Marinades, whether for shrimp, poultry or meat, are used more often for flavor than for tenderizing. Tough cuts of meat, such as flank steak, can become more tender if soaked in an acidic marinade, but too long of a dip will make the outside of the meat mushy. Shrimp are naturally tender, so an overly acidic marinade can actually start the shrimp “cooking” before you even put them in the pan! If you want to marinate shrimp prior to cooking, don’t use an acid—save it for your serving sauce. Delicious shrimp appetizers served cold with a zesty sauce.